Bottom Line: Based on testing done to date by Gluten Free Watchdog, products testing “low gluten” using Nima tested from below the limit of detection of 1 ppm gluten up to 18,963 ppm gluten using the R5 ELISA. Barley flour also tested low gluten. Based on these results it is difficult to assess the meaning or understand the usefulness of a “low gluten” Nima reading. Why did we test gluten-containing products: We tested a variety of gluten-containing products out of curiosity to see how they would test using the Nima and to help determine whether “low gluten” and “high gluten” results correlated with R5 test findings. 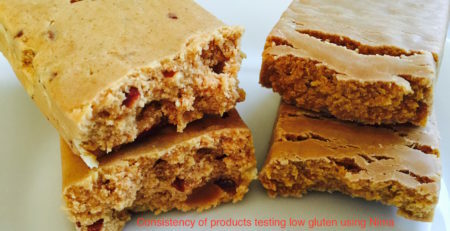 Gluten Free Watchdog also tested wheat flour, rye flour, and barley flour using the Nima. Approximately the same amount of each type of flour was tested. 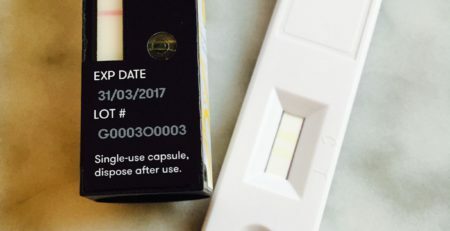 The samples were not diluted with water. Comparison testing: All product testing with the exception of the flours was done by Bia Diagnostics, LLC. 100% barley flour tested “low gluten” using the Nima. Barley grain and barley flour have both resulted in “low gluten” readings when tested by Gluten Free Watchdog. 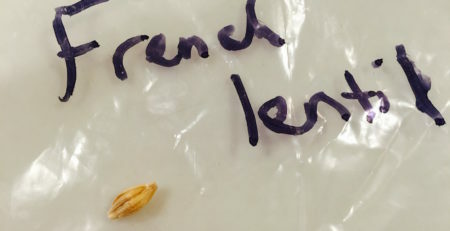 This finding raises the question of whether relatively low levels of barley contamination (as compared to barley grain/flour) would be detected in a sample when tested using the Nima? 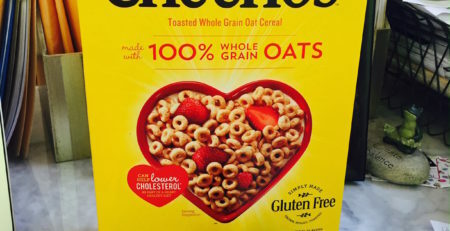 Gluten Free Watchdog has observed first hand that the main contaminant in some grains, legumes, and finished grain-based products is barley. In this analysis, products testing from 819 ppm to 18,963 ppm gluten using the R5 ELISA tested “low gluten” using the Nima and a product testing below 100 ppm gluten using the R5 ELISA, tested “high gluten” using the Nima. The Nima graphic referenced above suggests that a “low gluten” reading is most likely due to cross contamination. Keep in mind that all the products included in this round of analysis contained gluten as an ingredient. A certified gluten-free product testing below the limit of detection of 1 ppm using the R5 ELISA. 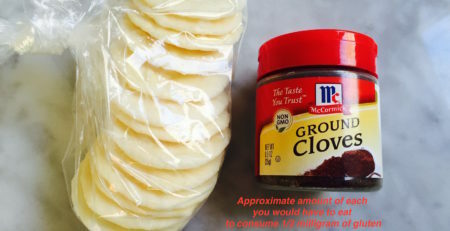 A product containing wheat flour as the second ingredient after spices and testing at 18,963 ppm gluten using the R5 ELISA. Gluten Free Watchdog will continue to evaluate the Nima. Any word from the people at Nima? This product should be taken off the market immediately and everyone should be refunded their money. Yes, we have been communicating. 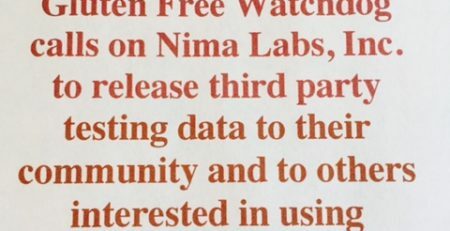 The Nima team should speak for themselves. Tricia, how is that you don’t have more followers? I’ve been in touch with Nima, asking for a refund, which they are grudgingly providing. They recently emailed consumers about improving their product, but they did not address any of the real concerns about false positives and false negatives. Unfortunately, at this point it appears they are selling snake oil. You have offered a level-headed, fact-based analysis, and no one is paying attention. This is very disturbing. Can the FDA get involved or some other consumer protection bureau? The folks in the Gluten Free Watchdog community are following this closely, Daniel. Sometimes it is not all that obvious who is paying attention to what. But trust me. The work we are doing is being noticed. So, no worries. Did you see the CNET article? 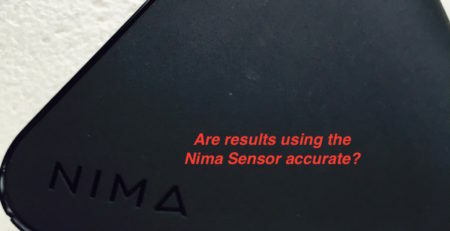 Here is the link https://www.cnet.com/news/can-the-nima-gluten-sensor-save-celiacs-its-complicated/ And there is a lot going on behind the scenes. But please, spread the word to your community. 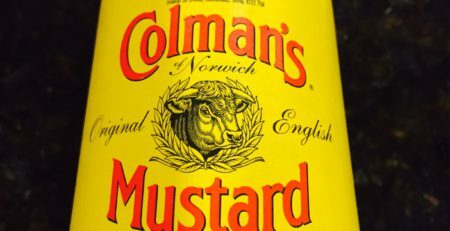 What’s to blame for possible false positive “low gluten” test results using the Nima? Bottom line: Gluten Free Watchdog has personally tested many products using the Nima Sensor….